A delicious and healthy breakfast to start your day! Fried eggs with saffron are delicious, simple and healthy. You want this to be a gentle method of cooking. Get your frying pan on a medium to low heat and add enough coconut oil or olive oil to lightly coat the bottom of a large non-stick pan (about 1 tablespoon). Crack the eggs into the pan. As the oil gets hotter you'll see it start to change the color of the eggs. If the oil starts to spit it's because it's too hot, so turn the heat right down. 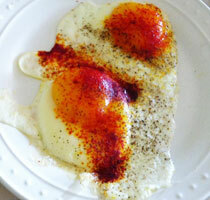 Sprinkle 1/8 tea spoon Exir saffron Powder, dash of sea salt, and freshly ground black paper, and tiny amount of cayenne pepper on the eggs cook until the tops of the whites are set but the yolk is still runny. When they're ready, remove the pan from the heat and take the eggs out using a spatula. Place on a plate, serve on toast - no need to butter it, or by itself with some strawberries. Copyright Epicure Garden. All Rights Reserved.